Permanent sports in the centre: Winter: Biathlon, Bobsled, Figure Skating, Ice Hockey, Luge, Skeleton, Skiing (all disciplines), Speed Skating. Summer: Canoe /kayak, Distance Running, karate, Rhythmic Gymnastics, Synchronized Swimming, Team Handball, Triathlon, Volleyball, Water Polo, Wrestling. Sport facilities: Gym: 20,000 square feet - flexible - use gyms. Olympic Regional Development Venues: state of the art bobsled / skeleton / luge track, K90 & K120 ski jumping hills, freestyle ramp, 750,000 gallon pool for aerial skiing, Whiteface Mountain, mountain biking, arena has four ice sufaces, biathlon range. 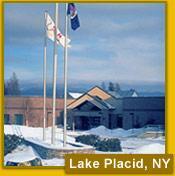 Support services: Both services are available at the Lake Placid Olympic Training Center. Studies arranged, available for athletes in the centre or externally: The Athlete Services Center is located on the Lake Placid Olympic Training Center complex. This service provides athletes with internet access, career planing, performance enhancement seminars, life skills seminars, and coaches programs. Residence number of beds: Number of beds 260 , $60 US per person / night, includes lodging, meals, aiport transportation, and training facilities.